Sid Meier’s Civilization 5 rode a wave of high praise into stores and digital storefronts when it launched at the end of 2010. And why wouldn’t it have? In the 20-plus years since the series first launch, Firaxis Games has shown again and again that there are ways to both improve and still reiterate on the turn-based world-building formula. Civ 5 wasn’t without its drawbacks, but fans deemed it largely worthy. Patches and updates have emerged since the game’s launch to improve various elements, but the first full expansion pack, titled Gods and Kings is set for release this spring. I got a chance to take a peek at how some of the pack’s changes play out in a GDC demo last week. Religion is a big focus in the new expansion, as you’d probably already gathered from the title. Religion played a significant role in the core gameplay for Civilization 4 but it didn’t make the cut in the 2010 release. With Gods and Kings it’s back with a holy vengeance, allowing players to spread their doctrine across the world through both passive and aggressive means. Religion in Civ 5 is going to be the most impactful during the early- and mid-game phases. There are new features for the late-game as well in this expansion, but religious beliefs become integrated into each civilization by that point. Unlike the real-world religions of Civ 4, you’re actually putting some effort into building a faith this time around. It all starts at the most basic level: establishing a system of beliefs. You do this by selecting a pantheon from a long list; much like choosing your civ at the start of a game, each pantheon offers different bonuses to support different types of play. The God of the Sea, for example, provides +1 production from fishing boats whereas the God of War bumps up your faith — a religion-based stat, analogous with culture and the like — whenever you win a battle within four tiles of a city tied to that belief system. The next step on your road to founding a new religion requires the spawning of a Great Prophet, which you won’t be able to do until you’ve accrued a minimum of 200 points in faith. It’s a random occurrence after that, so you’ll just need to cross your fingers and… err… pray. Once you’ve got a Great Prophet added to your ranks, you can “spend” him on founding this new religion. You’ll choose a symbol for it from a list of presets and assign it a name. The chosen symbol then appears in the info bar for any city associated with that religion. Any cities within 10 hexes of the source — whether or not they’re part of your own civilization — will slowly convert over to the new faith. You can speed this process along as well; missionary units allow for the spreading of religion while inquisitors, which appear later in the game, stamp out competing religions in one city or another. Once your religion is squared away, it’s time to choose both a founder belief and a follower belief. Founder beliefs offer boosts as your religion spreads across the land whereas follower beliefs bring specific benefits to the cities that worship your gods, whether or not they’re part of your civ. This can be useful for expansion; one such follower belief boosts the fighting power of your civ’s troops whenever they’re close to a city that worships your religion. The combat system also sees some significant tweaks in Gods and Kings, starting with a new value scaling that calculates things using a 100-point system rather than the 10-point one that the 2010 game shipped with. Units and cities are significantly tougher to bring down, which adds value to each playing piece in your growing army. A lone catapult, for example, could conceivably survive an enemy attack and be pulled back behind friendly lines on its next turn. Previously, a unit like that left alone was a surefire way of losing that unit. There are also a bunch of new units to work with, both civ-specific ones from the nine new civilizations that the pack will add and more general ones, particularly in the naval category. There are now two different types of war-making vessels, allowing for both ship-to-ship distance attacks and naval “melee.” This means you’ll be able to use your boats to capture coastal cities. 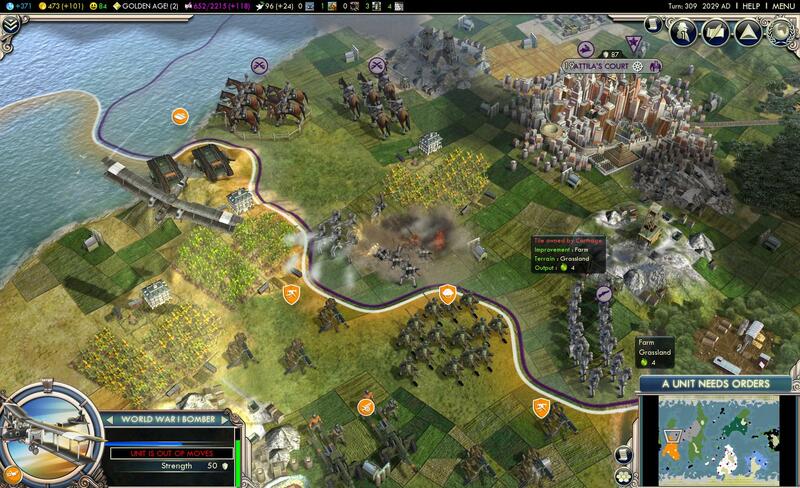 The rest of the expansion pack is primarily concerned with improving the way civ-to-civ relations work. City-states have been significantly retooled. In addition to them now coming in several new flavors — mercantile and religious — you’ll also now receive quests from each one. Completing a quest earns the favor of that city-state. A city-state quest can be anything from destroying a nearby barbarian encampment to spreading one religion or another to their city. You can still shower these not-civs with gold and essentially buy them off, assuming you’ve got enough ready cash available, but quests will be your primary tool for getting city-states in your pocket. The last of the big system changes brings espionage into the game in a big way. Spies are a limited resource. You’ll get your first one when the Renaissance starts and then another one with each new era after that. You’ll also get one for building a national intelligence agency. Spies are off-map units that must be assigned to specific foreign cities. They earn experience and level up for completing tasks, just like regular units do. The big difference is, you’ll select these tasks from a menu rather than guiding a physical icon’s movements. Once a spy is installed in a city, you’ll start receiving a drip-feed of information about the goings-on in that city and the civilization that owns it. You’ll also be able to influence local sentiments. Spies assigned to a city-state can influence elections that are held every 12 turns, swaying the people more toward allegiance with your own civ. Alternatively, you can have a spy incite a coup with the goal of a total regime change. What you do with this info is entirely up to you. New diplomatic options will allow you to reach out to potential targets and warn them in advance. Not only can this curry favor with a competing civ, it can also create wars where none existed previously. There’s plenty more coming in the Gods and Kings pack. New military units, civilizations/leaders, Wonders, buildings, resources and more. Not to mention some new custom scenarios. We’ll probably be hearing more about the expansion pack as the spring release draws closer, but Gods and Kings certainly looks to be adding a wide assortment of content to suit the vast range of different Civ fans.